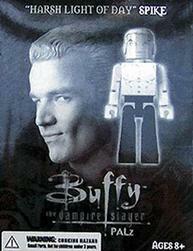 The third episode of the fourth season of Buffy the Vampire Slayer "The Harsh Light of Day" was memorable because it marked Spike's return to Sunnydale, to located the fabled Gem of Amara; for some fans, it is remembered as the first opportunity to get a glimpse of a shirtless Spike. Palisades celebrated "William the Bloody" with this limited edition "shirtless" Spike PALz figure that was produced in extremely low quantities and was never vailable via retail or wholesale outlets. Redemption cards for the special "shirtless" Spike figure were inserted into packs of Inkwork's "Spike: The Complete Story" card set at a rate of one per case.